รอบการทานบุฟเฟ่ต์ 6 รอบต่อวัน คือ 11.30 - 12.30 น. / 13.00 - 14.00 น. / 14.30 - 15.30 น. / 16.00 - 17.00 น. / 17.30 - 18.30 น. / 19.00 - 20.00 น. 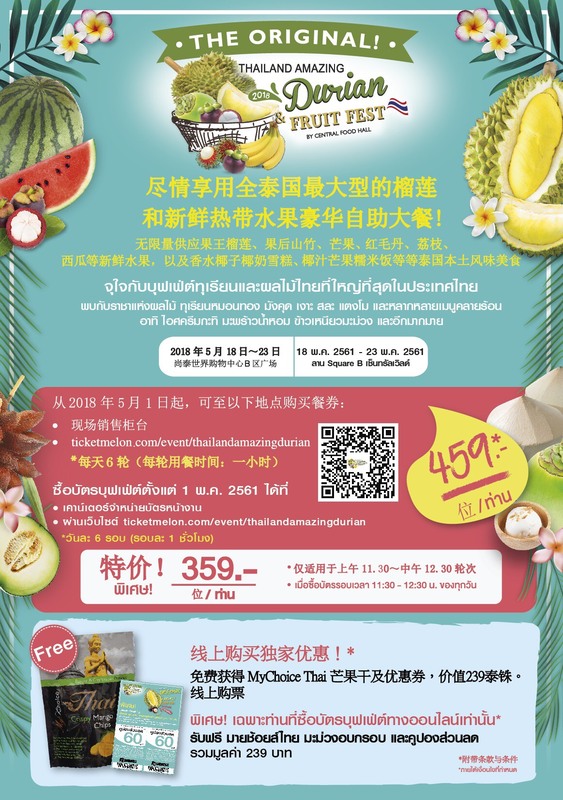 Experience Thailand’s original and largest durian festival and enjoy all-you can-eat buffet that features your most favorite and exotic Thai fruits ranging from Monthong durian, mangosteen, mango, rambutan, salak and watermelon. Plus, complement your sweet meal with refreshing coconut water, coconut milk ice cream and mango & sticky rice. There are 6 rounds available per day : 11.30am – 12.30 p.m. / 1.00 – 2.00 p.m. / 2.30 – 3.30 p.m. / 4.00 – 5.00 p.m./ 5.30 – 6.30 p.m./ 7.00 – 8.00 p.m.
Limit dining period to 1 hour / round and reserves right to fine 1,000 Baht / person when a third of your dish is left. Food in Durian Buffet is reserved for dine in only. All food and beverage served in the buffet cannot be taken out of the buffet zone. The buffet ticket is NOT valid with any other promotions or discounts. This ticket cannot be returned for a refund and buffet round specified on the ticket cannot be canceled or changed after the ticket fee that includes the cost of goods and services is paid to Central Food Retail Co., Ltd.
Free of charge for child less than 130 cm. height / Normal price for child whose height is 130 cm or over. Children under 15 years old enter the buffet zone must be under parental supervision. Pets are not allowed in the event area. Outside food and beverages are not permitted in the buffet area. This ticket cannot be returned for a refund and buffet round cannot be canceled or changed. Central Food Retail Co., Ltd. reserves the right to increase, reduce or change food menus and terms and conditions without prior notice. 459 Baht / person/ round.